A rebound in house prices and near-record-low interest rates are prompting homeowners to borrow against their properties, marking the return of a practice that was all the rage before the financial crisis. College costs continue to rise, so home equity loans may rebound in popularity as a tuition-funding vehicle. Ian Feldberg planned to open a $200,000 Heloc this week with Belmont Savings Bank to help pay his son’s college tuition. The medical-device scientist purchased his home in Sudbury, Mass. for a little over $1 million in 2004, and estimates that its value dipped as low as $800,000 during the financial crisis. However, after applying for the line of credit, he found that its value had completely recovered. “I’m very pleased about that. My options for tuition fees were either that or to cash in on my pension prematurely,” he said. A too-big-to-fail bank steps up home equity lending, and Tyler Durden of Zero Hedge expresses some concern. The Wall Street Journal reported yesterday that home-equity lines of credit (Helocs) had increased at a 8% rate year-over-year in 1Q14. Some banks are more aggressive than others, and perhaps we shouldn’t be surprised to see TBTF government welfare baby Bank of America leading the charge, with $1.98 billion in Helocs in the first quarter, up 77% versus 1Q13. 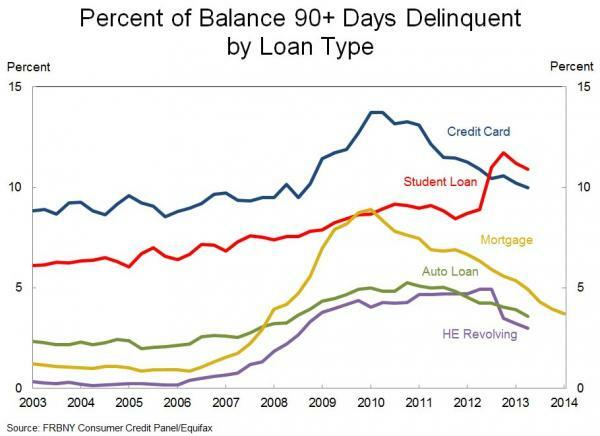 As HELOC delinquencies are off their highs (for now) but remain elevated… (we are sure this renewed ATM usage on the back of created wealth and stagnant wages won’t harm that downward trend at all…) – will we never learn? Think about that for a minute. A “medical-device scientist” can’t send his kid to college without either a Heloc or cashing in on his pension. Tyler Durden, “Home Equity Loans Spike As Americans Scramble For Cash”, Zero Hedge, 05/31/2014.